You don't have to resort to black-hat SEO techniques to rapidly achieve the organic traffic growth you're looking for, and depending upon your industry and competitive landscape, you may not even need an aggressive link-building strategy to complement our laser-targeted, well-optimized content. Here you'll see results from a featured client who has recently hired Propel Web Content to augment their Search Engine Optimization efforts with custom-written webpage content and/or blog articles. USAMicroscopes.com hired Propel Web Content to write and publish 15 blog articles over a span of several months in late 2016 and early 2017. 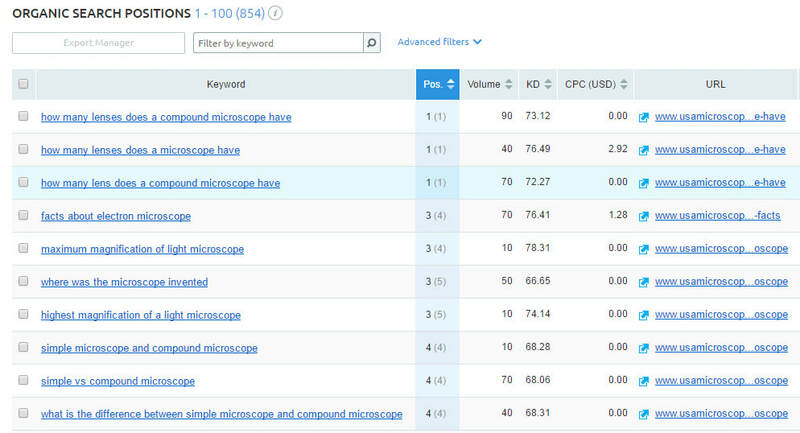 We completed keyword research which aligned with their blog content goals of creating a resource that would offer helpful information and answer questions asked in information-based search queries about microscopes. We then wrote and published these articles for them for a totally hands-free blog management solution, sending them weekly updates and links to published articles. ​Their website continues to see organic traffic growth as these articles now rank #1 and in the top 5 organic search positions for many of the keywords we targeted. For a modest investment in search engine optimized blog content, this site was able to increase their organic traffic by over 300% within a year's time. Organic Traffic & Ranking Data provided by SEMRush.